The increasingly diverse range of beers keeps rolling off the line at Stockade Brew Co, with rolling being the operative word here as their latest release has been named Roly. 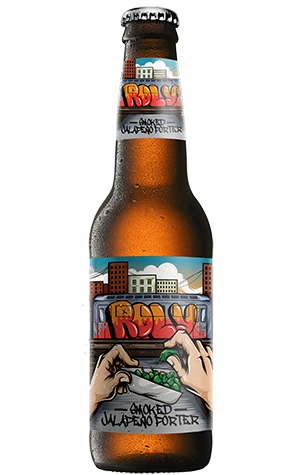 It’s a smoked jalapeño porter and the label, with its graffitied train (they went so far as to get a real train painted this way) and quasi drug imagery, suggests a beer packing a measure of grit and menace. But Roly is something of an undercover dealer and the evocative label is its front. A better representation of the beer would have those hands holding not a jalapeño spliff, but clutching a chocolate bar. Roly is a smooth, slightly smokey and above all chocolatey porter. The jalapeño character is there but only subtly so – anyone that is scared off by the mention of chilli in beer ought not be worried as it’s barely more than a sprinkle of spice. The recipe for the beer apparently came via someone called Trev who was the winner of a Stockade homebrew competition. Judging by the way Roly rolls, Trev’s street cred ought to have risen recently.